Shaving cream is the most important element for getting a smooth and close shave, right after choosing the razor. There are other factors to consider such as the shaving technique, thickness and texture of hair, or even your attentiveness during shaving. But nothing comes close to the first two primary elements – the razor & shaving cream! When it comes to shaving with straight razors, it is an absolute must to get the best shaving cream for achieving a satisfying shaving experience. As straight razors only have one blade, it is important that the hair is moisturized and softened before cutting. This allows the blade to glide smoothly and closely over your skin to deliver a close & clean shave. There are many shaving creams available in the market, but not all of them are suitable for shaving with straight razors. The best shaving cream for straight razor should create rich lather and contain moisturizing elements such as glycerin or natural oil. This not only softens the hair, but also keeps your skin moisturized. Shaving cream or soap! 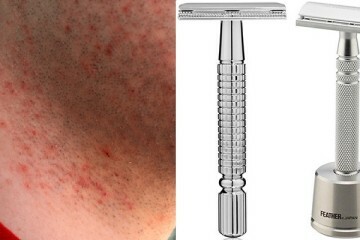 which one is best for straight razor shaving? Shaving soaps are the more traditional way of lathering the hair and it has been used for hundreds of years for wet shaving. 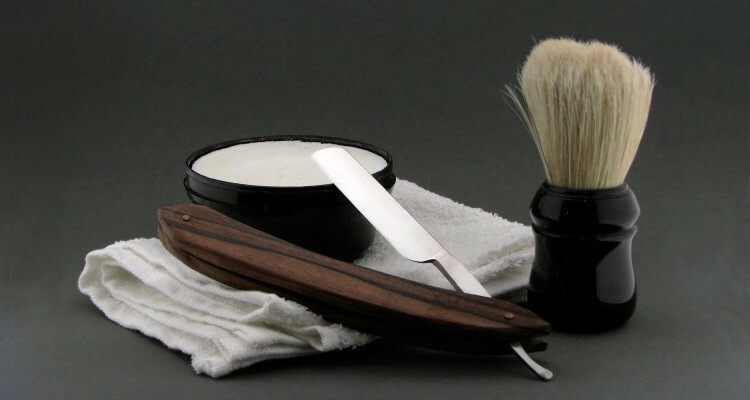 Shaving creams, on the other hand, are a more modern way to take on lathering for wet shaves. Soaps comes in shape of a bar or disc which need to be soaked in water before applying. But shaving cream requires less consumption of water to generate the foam. Soap normally generates richer lather in texture which is great for shaving with straight or double edge safety razors. But shaving with soap becomes an inconvenience when it comes to shaving with other types of razors, such as cartridge or electric razors. This is because the blades get clogged up and you have to rinse repeatedly during a shave. Another advantage of shaving creams is its great diversity. It can be used with any type of razor. It can create a rich foamy lather for lifting and softening the hairs for both straight & safety razors. Also, it can be effectively used for cartridge or system razors. So, in today’s modern days, it is much easier and more convenient to use shaving creams instead of shaving soaps. Taylor of Old Bond Street is one of the oldest and renowned brands in the market for making the best quality shaving creams for straight razors. Any review will be incomplete (or at least inaccurate) if Sandalwood Shaving Cream is not included among the best. Taylor of Old Bond Street gained fame in the industry by introducing botanical extracts in its formula. The botanic extracts are gentler on skin and create less irritation, making it perfect for those with sensitive skin. The texture feels almost like lotion, which is easy to apply and turns into a rich lather within just a few seconds. The lather delivers an ideal cushion for the blade to smoothly glide on skin for a close shave. Meanwhile it keeps skin moisturized and irritation free. Along with the sandalwood extract, it also has glycerin and other essential oils. Taylor of Old Bond Street Sandalwood Shaving Cream is a specialized cream best suited for straight razors and double-edged safety razors. 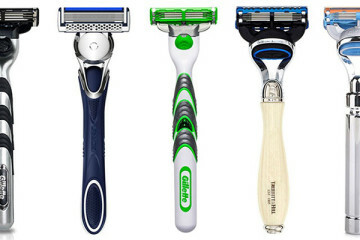 However, it is able to deliver impeccable performance with system razors, as well as electric razors. The cream comes in a resealable bowl which makes your life even easier for frequent using as well as storage. Taylor of Old Bond Street has been in the market since 1854 and it is still going strong in the shaving cream industry. I would definitely recommend something that has been in the market for such a long time. As this cream is particularly designed for straight razors to deliver the closest and smoothest shaves, it is definitely worth a try. I particularly like the masculine and mild sandalwood aroma of this shaving cream. It is perfect for those who do not like strong scent in their shaving creams. Its glycerin and essential oils keep the skin soft and moisturized long after shaving. Even if you are a frequent shaver, it will last you longer than other shaving creams. Due to its rich lather texture, it tends to dry up on your face if applied for a long period. It is recommended to store the cream sealed and in a dry place to avoid drying up. Cremo Original Shave Cream is a barber grade shaving cream for delivering ultra-smooth and closest shaving experience. Cremo has formulated this cream with the most skin friendly ingredients found in nature such as macadamia seed oil, aloe, calendula extract, lemon extract, papaya extract, and olive leaf extract. It softens the hair and opens the pores of your skin allowing the blade to glide over your skin effortlessly. A little squeeze, as small as an almond, will create rich lather over your skin, letting you shave with literally any type of blade. The smooth glide over the skin eliminates any chance of nicks, irritation and razor burns while delivering a close and comfortable shave. Also, the botanic fruit extracts and natural oil provides moisturization for your skin and creates a gentle aroma around you while shaving. 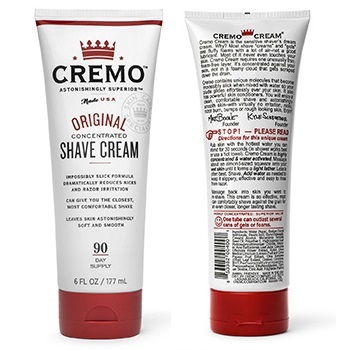 The Cremo Original Shave Cream comes in a convenient tube which is easy to use and store. One tube can deliver up to 90 days of shaving. The cream is easy to apply and rinses off very easily with water. The natural antiseptic element helps to heal any nicks and cuts while keeping your skin moisturized. As it is a barber grade shaving cream, it will deliver astonishing performance with its superior organic ingredients. I recommend this cream for people who enjoy close shaves, especially with straight razors. Its rich and thick lather works like a layered cushion to your skin for minimal skin damage. This provides a smooth and close shave, every time! The Cremo Original Shave Cream is one of the top recommendations by barbers and hair styling professionals. As it is easy to apply and does not dry up quickly, it can be left on during a shave for longer period of time with more attention to details. Also, it is the best option for those who are looking for the best value for their money. As just a little drop of this cream will deliver a sufficient shaving experience. The Cremo Original Shave Cream needs to be applied with a brush to achieve the rich lather and best performance. It is recommended to store the cream in cold and dry place for longer shelf life. The Art of Shaving Sandalwood Shaving Cream is the pinnacle of shaving creams for delivering high quality performance and comfort. 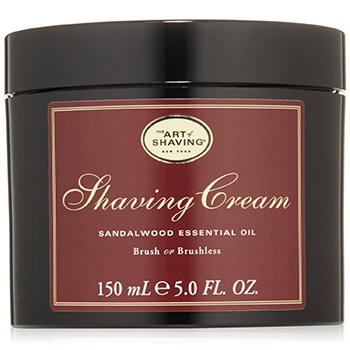 This cream can deliver the right balance of smooth and close shaving as well as comfort. It has a lotion like texture that becomes a rich luxurious lather on your skin with just a few swings of your brush. Just a fingertip of it will generate a thick layer of foamy lather on your skin. The lather covers the hair and pores making them soft for easy & smooth gliding for the razor blade. This protects your skin from any nicks, cuts or irritations while providing the closest shaving experience. In addition to that, it nourishes and moisturizes the skin to leave it refreshed long after your shave is completed. The unique formula of this cream has an anti-aging component that makes your skin look younger. The sandalwood essential oil works as a natural antiseptic which helps to relieve inflammation and heals any scars or dark spots. It contains glycerin, coconut oil, and organic essential oils. The sandalwood aroma of this cream is subtle, so it does not cause irritation for those with sensitive skin. The Art of Shaving Sandalwood Shaving Cream demonstrates its performance in four different steps. It makes skin ready for shaving, lathers it up, eases the blade gliding and moisturizes skin. It is one of the strongest contenders for my recommendation of the best straight razor shaving cream. Also, you can get high performance with this cream with cartridge or electric razors also. It is a glycerin-based shaving cream with sandalwood essential oil and it is highly recommended for those who suffer from dry and sensitive skin due to shaving. As it will keep your skin moisturized during and even after shaving. It will protect your skin from irritation and razor burns, nicks, or cuts. For frequent shavers, it is just the right choice with an easy to use & store resealable container. There is a slight possibility of dripping issue if you have applied too much water with this cream. It is recommended to shave during or after a hot shower for best results. Keep the container sealed and keep away from water after use for longer storage life. 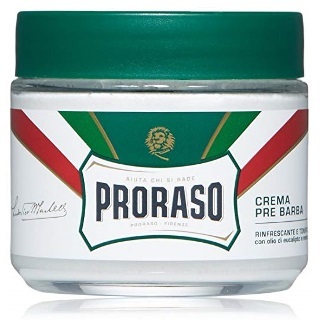 Proraso Refreshing and Toning Pre-Shave Cream has been designed for professional use. It has been the first choice of many barbers and hair styling professionals for decades. This pre-shave cream has been formulated with unique ingredients which generates a uniquely rich and thick lather, without the common greasy texture. It softens hairs and enhances the suitability of your skin for an irritation-free, easy blade glide, perfect, close shave. The cream contains glycerin, eucalyptus oil and menthol in its ingredients. Glycerin keeps the skin moisturized. The eucalyptus oil is a natural antiseptic agent which helps to reduce skin inflammation. It also helps in the healing of any cuts or razor burns. The cooling agent from the menthol keeps skin feeling refreshed and revitalized for longer. This cream has been tested and approved by dermatologists. It is a cream with a 98% natural ingredients origin It does not contain artificial colors, parabens, silicones, SLS or ingredients of animal origin. The cream is very easy to apply. Just soak your skin and apply a bean-size amount and gently rub in circular motions with your fingers and do not rinse. Shave normally with the grain first with straight razors or any other types of razors for best results. Proraso Refreshing and Toning Pre-Shave Cream has been created to be extremely gentle on the skin while shaving and have it looking & feeling great after. So, I strongly suggest this shaving cream to shavers who have sensitive or dry skin. Couple of the great exceptional features of this pre-shave cream is the presence of eucalyptus oil and menthol oil. These two ingredients contain natural antiseptic agents to revitalize and tone your skin. It is the right choice if your skin gets allergic reactions against artificial colors or parabens. Also it does not contain any ingredients of animal origin. Therefore, it is highly recommended for vegans. Last but not the least, this pre-shave cream creates an incredibly rich and deep lather, making it highly suitable for use with straight and double-edge safety razors. Most suitable cream for shaving with straight razors! Due to its incredibly rich and deep lather, it may clog the blades of cartridge or a multi-blade disposable razor. Making it ideal for straight razor users. It contains some synthetic ingredients, but mostly natural. If you are looking for a shaving cream that can handle multiple roles at the same time. Then Jack Black Supreme Cream Triple Cushion Shave Lather should be your choice – it is a three-in-one product! Unlike other shaving foams or gels, it brings hair away from skin for easier shave and leaves skin moisturized and relaxed. The three moisturizing layers of Jack Black Pure Science formula generates a protective cushion between your skin and blade. It helps to eliminate any skin irritation; razor burns or nicks to deliver a painless shaving experience. This cream is formulated without any synthetic aroma, artificial coloring and parabens. It contains all-natural ingredients and is made in cruelty-free environment and tested by dermatologists for safety. Its unique formula contains macadamia nut oil for penetrating beneath the skin surface to moisturize and soften skin. Also, it has soybean oil which has antioxidants for enriching the skin with natural moisturizer and a soothing sensation. Jojoba oil is also included to soften, hydrate, and shield the skin, while glycerin helps with preserving the moisture of the skin. Natural edelweiss extract relaxes the skin. Jack Black Supreme Cream Triple Cushion Shave Lather is sincerely created with the best natural ingredients to perform efficiently. I strongly suggest this cream for frequent shavers for quick, effective and close shaving. It is a dermatologist proven shaving cream which is gentle for skin and provides better skin protection & moisturization by avoiding dehydration, because of the glycerin and macadamia nut oil. It is suitable for vegans as it does not contain any parabens, harsh surfactants and artificial colorants. If you have sensitive skin that reacts to artificial agents in shaving creams, then this cream is the right answer to your calling. Also, it is very helpful for shavers with dry skin. Apply on moist skin surface with brush to get the best results. Due to the richness of the lather, you might face blade clogging if you are using cartridge or multi-blade disposal razor, instead of a straight razor. Rinse your face with cold water to wash off the foam properly. Choosing the right shaving cream for yourself can be tricky, if you do not have any prior idea of your needs and specific requirements. This is why it is extremely important to understand your skin type, hair type, and your allergens to get a safe, secure & satisfying shaving experience. This is one of the major factors that you should consider before you buy your shaving cream. Different people have different types of skin and they react differently to certain ingredients which are included in the making of the shaving cream. If your skin is sensitive to certain chemicals which are present in the cream, then you should avoid those shaving creams. If you have dry skin, then you should get glycerin based shaving cream or creams which has natural oils. You will save yourself from the devastating effects of many types of skin conditions by making these careful considerations. Shaving experience mainly depends on two major components, the razor and the shaving cream. Unsurprisingly, their performance is also dependent on each other. Some creams are suitable for straight razors and some are suitable for cartridge or electric razors. Creams suitable for straight razors generate a rich and thicker lather to help lift the hairs, for easier cutting using just a single glide. But there are chances of the blades getting clogged with the same cream, when used with a cartridge of disposable razors. So, the wrong combination of shaving cream and razor is also harmful. Not everyone likes to use a brush for applying the shaving cream on their skin. Some people, like myself, use their hands to lather the cream or gel. All creams can be applied using a brush, but not all cream performs the same without a brush. Some of the creams actually require a brush to create the foamy texture on the skin. So, it is important to read about the application method before you buy the shaving cream, if you have a particular choice or preference. 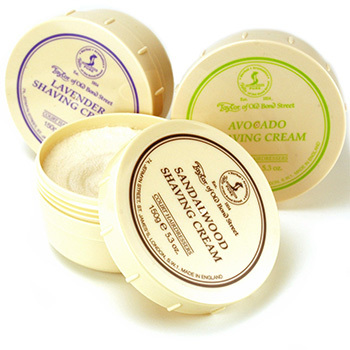 You should look for organic ingredients such natural oils and extracts in your shaving creams. Also, look for glycerin-based creams for better moisturizing effect on your skin. Natural oils such as eucalyptus oil, jojoba oil, essential oil, soybean oils are all full of antioxidants that revitalize your skin. On the other hand, organic extracts such as sandalwood extract and edelweiss extract are natural antiseptics that enhance the healing ability of your skin. Even the simple cooling effect from menthol is a crucial element of an excellent shaving experience. So, look for these beneficial ingredients when shopping for shaving creams. One thing is clear to all that artificial agents are trouble! Artificial preservatives can cause asthma attacks or lead to other serious allergic reactions. Other chemicals such as Sodium Lauryl Sulfate (SLS) are used for cleaning the skin, but it also strips away the natural oil and moisture from the skin. Also, some creams contain SLES which is included to reduce the side effects of petroleum-based products but also may cause some serious side effects like organ toxicity. You should also avoid creams that have artificial colors and fragrances. Being more aware of these ingredients will help you to make better decisions which may have serious consequences on your health & wellbeing. So, these are just some of the many crucial aspects to be considered before choosing a shaving cream to use. Sometimes even the simples of things such as the aroma and scent of the cream and how comfortable you are with it, will affect your satisfaction level. Also, the unique skin texture and thickness of your facial or body hair can be the deciding factor. So, consider these things before finalizing your decision on a shaving cream to use with your straight razor. Shaving is an essential part of men’s regular lives! Sometimes it can get tedious as you have to do the same thing again and again at least 3 or 4 times a week. Shaving with a straight razor requires more time and attention. It becomes more hectic if you end up with below par and inefficient shaving cream. Therefore, it is important that you choose the best shaving cream for straight razors. There are many different variations of shaving creams available in the market and it is very likely to end up with a sub-standard shaving cream, if you do not have any knowledge about them. I hope this review and my suggestions will help you to choose the best shaving cream for a satisfying shaving experience.